A while back, fanseelamb made some AM PJs with t-shirt tops. Trapping separated the t-shirts as AM tops, and Ale made a set of 15 recolors. 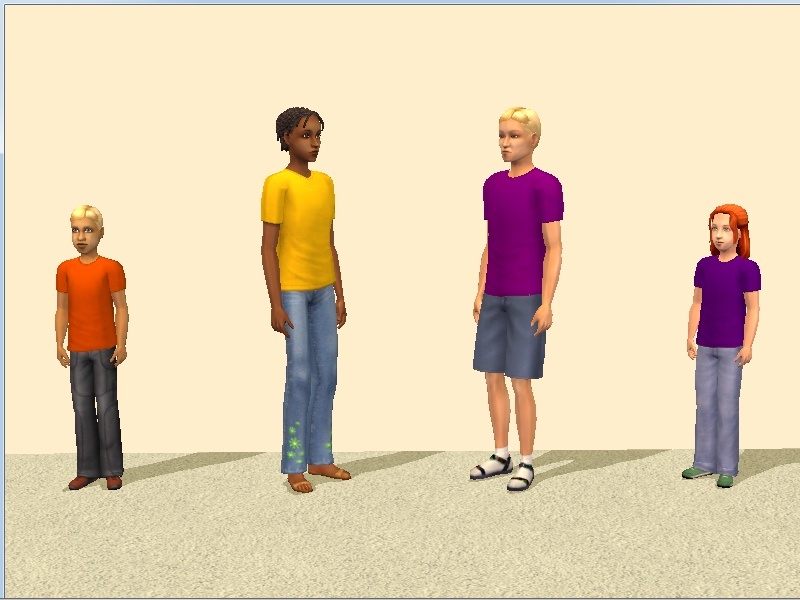 While the AM t-shirt mesh has been converted for children, teens, elders, and adult females, I'm not aware that Ale's recolors were ever converted, so I did that. 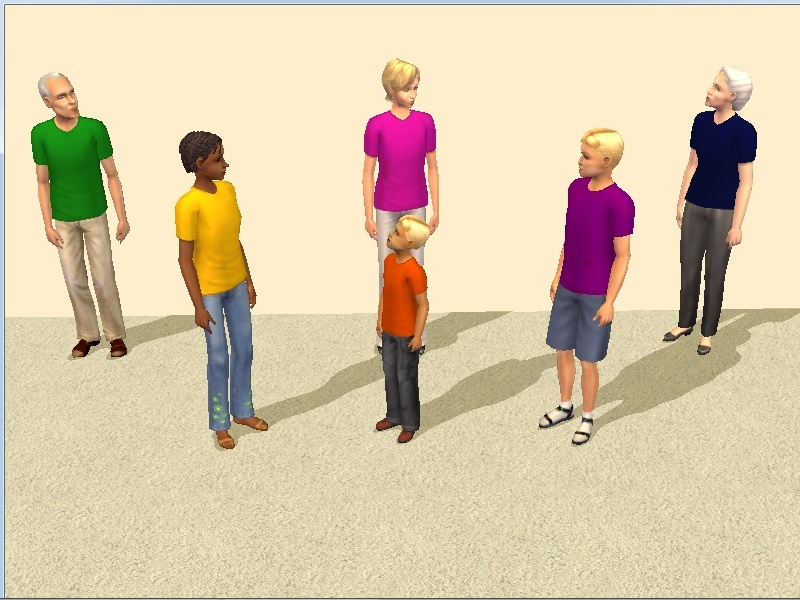 There are six sets, for elder males, elder females, adult females, teen males, teen females, and children. The child set is available to both males and females. Each set is in its own rar file, and each rar file contains the appropriate mesh. While there are a lot of packages, they're texture-linked to Ale's AM recolors, so the individual packages are very small. However, you will need to have Ale's recolors in order for these outfits to appear. My filenames and tooltips refer back to Ale's, so you can just install the colors you want. 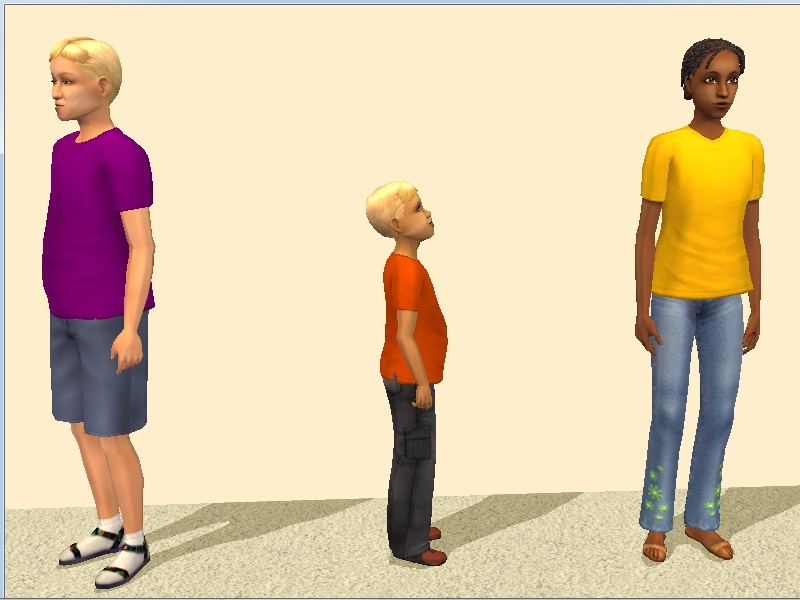 All meshes have fat morphs. The AF mesh has a pregmorph, but getting it to line up with a pregmorphed bottom on a pregnant Sim may be a matter of trial and error. As a bonus, I've included an AF version of the original grey, black, and white PJ tees. I did this because, at present, trying to find an AF version of the original tees doesn't seem to turn up anything; I couldn't even find a definite mention of them. I made these tees as standalone packages, using shirt textures separated from Trapping's AF conversion of fanseelamb's PJs. The shading on the shirts for the AF PJs is slightly different from that on the AM shirts, so while I don't know that the originals used the textures from the AF PJs, I can easily assume that they might have. Notes: a) If you have eir's original mesh, Keoni's will overwrite it. 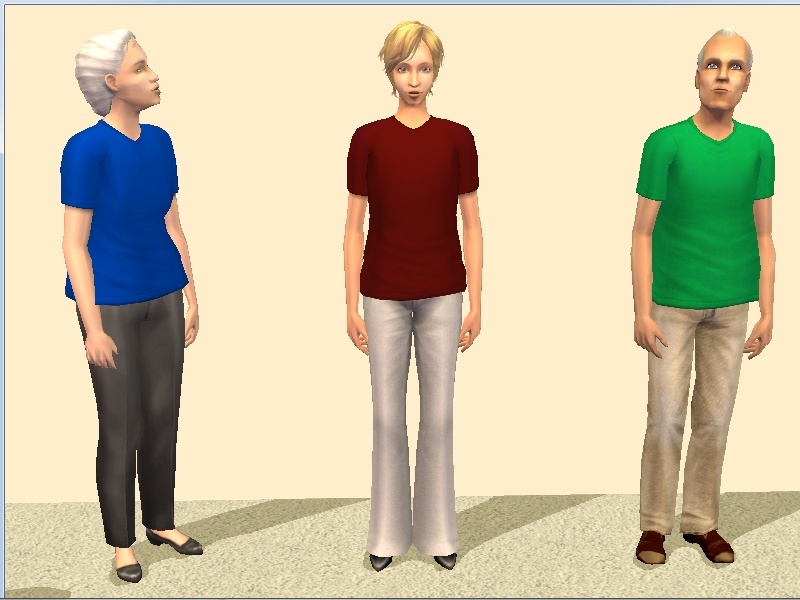 b) Eir's original mesh could show small gaps on the Sim's upper back or chest when one or both of his arms were in certain positions, such as Body Shop's standard hands-on-hips pose. Keoni's edits appear to have fixed this issue. c) Neither eir nor Keoni mentioned hands, but the poly count indicates that this mesh uses Tenshii~Akari's smooth hands. 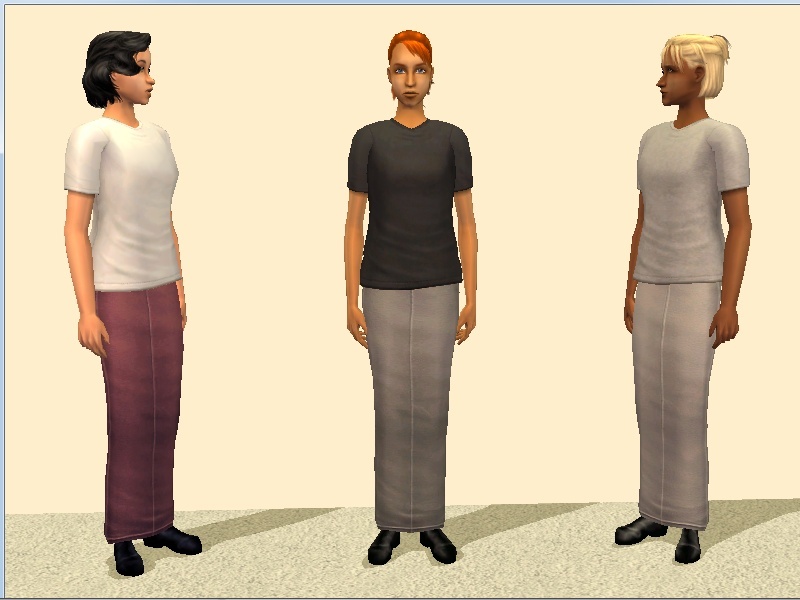 A Maxis-hands version does not appear to be available. Note: I've been unable to find any post by Trapping that has this mesh, any link to anywhere such a post might have been, or any archived version of an original set. The copy used here is from this set by DeeDee. Note: This download includes the AM textures and mesh. Eyes by Lyran (Wayback Machine link), geneticized and townified by Elddie. 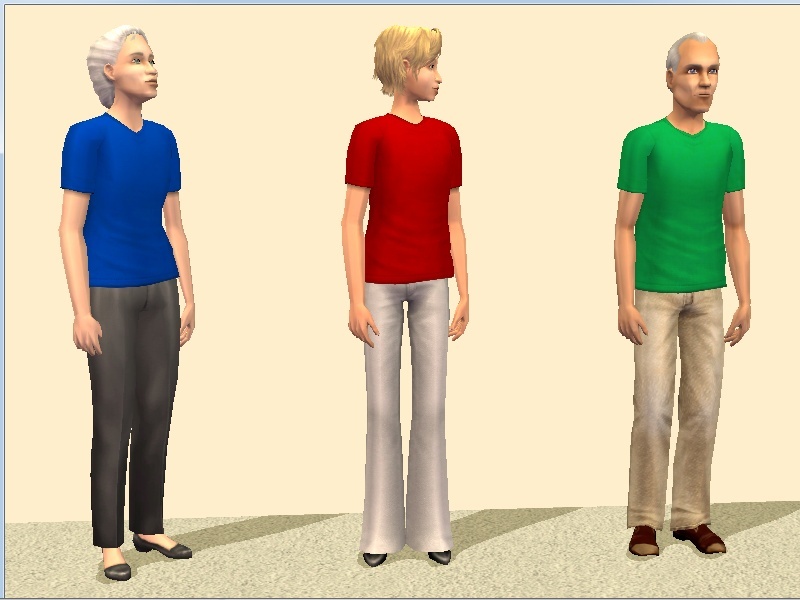 Bottoms for the TF, AF, and EM models use replacement meshes by CatOfEvilGenius. The bottom for the EF model uses a replacement mesh by Cocomama. Models for the bonus content are using a replacement mesh by CatOfEvilGenius, and wearing her untuckable AF versions of skirts by plasticbox. Jo, for the set of child shirts that got me to really look at the PJ tees. fanseelamb, for both the original full-body mesh and textures, and for linking to several related versions and conversions. Trapping, for originally separating the t-shirts as tops. Ale, for the original AM recolors, and for pointing me to fanseelamb's original PJs. 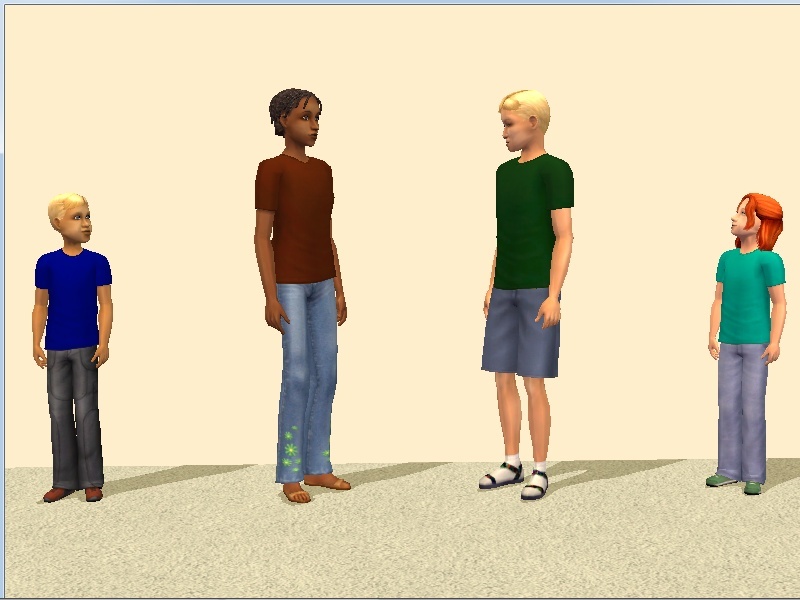 The sims2packrat tumblr, for providing an archived version of eir's TM version of the tees, and Keoni for fixing the mesh. 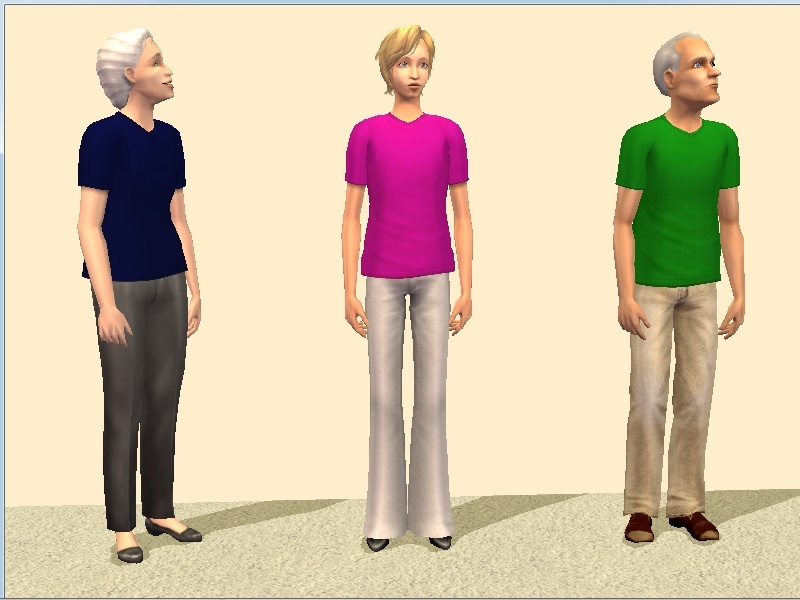 letthemplaysims for collecting all the age and gender conversion meshes into one place. While I didn't use anything from this set, I wouldn't have known about the TM and AF meshes without it. 13 people have said thanks to dharden for this download. Hil0 The originals are no longer available for downloads, because the site they're hosted on doesn't exist anymore... Could you upload the originals as well? I really want these shirts! The originals are no longer available for downloads, because the site they're hosted on doesn't exist anymore... Could you upload the originals as well? I really want these shirts! @Hil0 , Ale's DreamWidth is still there, and the download link works. It goes to Box, and what Box displays can vary depending on what it thinks it sees. It may or may not place a download button on the main screen, but there will generally be a button or link at the top of the screen. Depending on screen width, it may be a separate button, or may be folded into a menu under the square button with three dots.